We had some very large free run chicken (roosters) in the freezer and decided to make a meal of one. Kiriaki offered to make the potatoes as I had planned on boring mashed potatoes as one of the vegetable sides (although, soaked with yummy homemade gravy, mashed potatoes aren’t so boring). What Kiriaki came up with was brilliant! 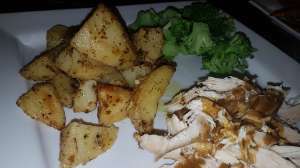 The potatoes were an awesome side to our roasted chicken and were done in the oven while the chicken was also occupied therein. Patates Riganates is a well known and common dish in Greece, with the addition of oregano (rigani), mustard, garlic and lemon. If you plan to make it (which you should), be sure to use a good bold Greek Oregano like KirIan’s – or the oregano flavour will likely be disappointing and overpowered by the other ingredients. Choosing Kirian Greek Oregano will ensure that the bold taste comes through when cooked with the other ingredients while roasting the potatoes. The Greek oregano (Origanum vulgare hirtum) is very important to the basis of this recipe; in fact, there are only one or two other dishes that include the name “riganates” in Greece. We place our potatoes in a heavy baking pan (uncovered casserole dish/ceramic is preferred- but pyrex will also work) and sprinkle with Kirian Greek Oregano. We add our mustard and cover with the lemon juice. We add our chosen quantity of minced garlic, salt and pepper and cover with the olive oil. 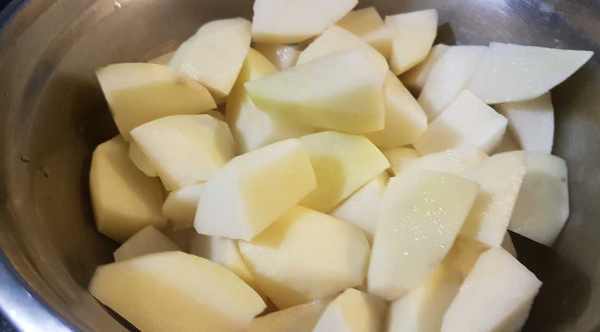 Finally, toss very well to coat with the oil (Alternatively, we can work all the above ingredients in the blender and make a paste, then toss the potatoes to coat all over). We cover the pan with aluminum foil and put it in the middle rack of the oven. We bake for 1 hour, remove the aluminum foil, and keep baking for another 30-40 minutes (depending on how much golden/brown we want our potatoes). 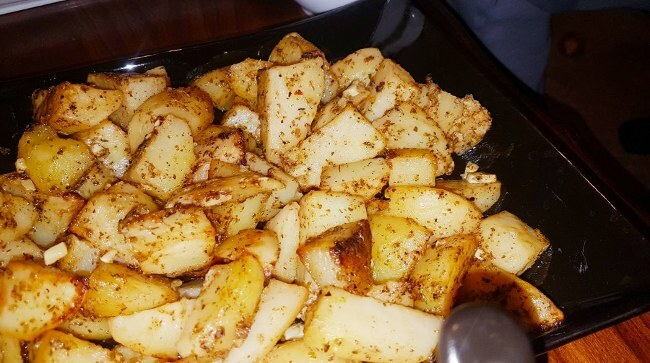 We are sure you will absolutely love those tasty flavorful potatoes that can go alone or with just everything! 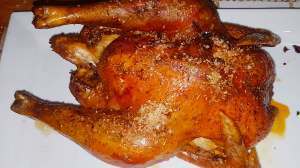 As far as a recipe for the roast chicken and gravy? Ian’s trying to figure that out as there is no written recipe; everything is done by taste and approximations, but we’ll do our best to come up with something! But follow the Patates Riganates recipe by Kiriaki, and you won’t go wrong!